Why consider trying project based learning? When I applied to college more than ten years ago, I wrote about my desire to be a political science major. Well, clearly that didn’t happen since I’m writing for ChemEdX. After my first organic chemistry course, I was hooked on the power that understanding the world through chemistry could provide. As an undergrad, I was given an opportunity work on a few different research projects in the realm of organic materials, and fell in love with the beauty of chemistry. While my classes were great, this immersion into research allowed me to ask authentic questions, garner a ton of experience with instrumentation, and, after a lot of failure along the way, even publish findings. I fell into chemistry by accident - how might the world change if people were more intentional at a younger age? I felt so strongly about this that after finishing my chemistry degree, I decided to teach high school chemistry. Given my experience doing research as an undergrad, I was intrigued with inquiry style teaching and learning and wanted to share that type of experience with my own students as I began teaching. However, I really struggled to give my students authentic scenarios to dive into during those first few years. (Safety issues? Not enough content knowledge required?). After my third year of teaching chemistry, I participated in a Project Based Learning training through the Knowles Science Teaching Foundation (based on Buck Institute pedagogy), and haven’t looked back since. From the training, I realized that I held the misconception that to use PBL in the classroom, it must be the only teaching strategy I used. I thought that I needed to skip the other rich experiences I felt like I was giving my students. Something that helped me see a larger picture on what inquiry and PBL can look like in the classroom can be found here - in a nutshell, PBL really incorporates guided and open inquiry. So how does PBL look in my classroom now? My students engage in a really big project once (and only once) a semester - it’s about as much as my students and I can emotionally handle. The majority of the time, my students are engaged in structured inquiry or a more traditional confirmation/verification format (many models exist - I use a lot of POGIL). PBL poses an authentic problem with multiple solutions. PBL requires core subject knowledge to propose solutions to a problem to an authentic audience. Some days, I just want my students to be able to tell me how to calculate the molar mass of methane or explain on a nanoscopic level why the pressure of a closed system increases when the temperature increases. Students are held accountable for this content on a state and local level, so they need to learn it (and I think they need to learn it too, for that matter). At least once per semester, I want to give my students the same rich experiences I had doing research in the lab. I give my students an authentic task that drives the whole unit from beginning to end. In future posts, I’ll dive into this in more detail. First semester, students need to identify two white powders from a crime scene, which leads them on a journey from ionic bonding, nomenclature, flame tests, and then a big picture perspective on the relationships between atomic interactions and macroscopic properties. 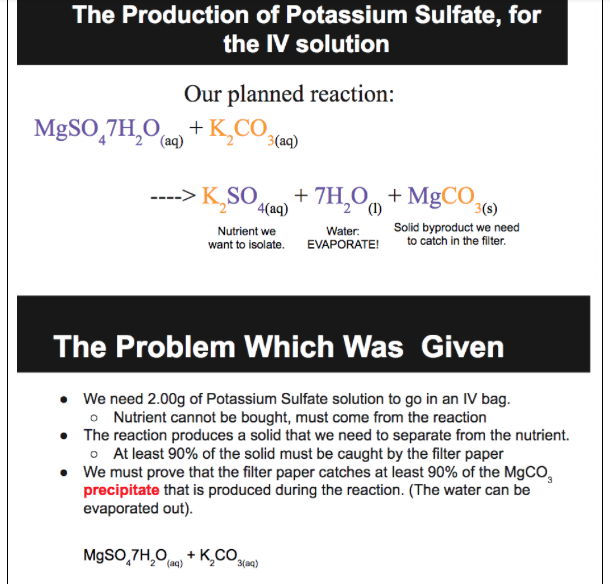 Second semester, students are presented with a challenge from a local pharmaceutical company to make 2.00 g of an aqueous nutrient for IV bags. My students then tell me that they must become proficient in stoichiometry to tackle this (ok, they don’t use those words, but that’s the heart of them telling me what they need to know). Let me dive a little deeper into the second semester challenge. The first day of our stoichiometry unit, before they even know what that word even means, where students learn how to use mole ratios, determine limiting reactant and percent yield, my students watch a short video of Tera. Tera works for a local pharmaceutical company, and her team focuses on providing nutrients via IV bag. Specifically, they must provide 2.00 g of a nutrient to their patients. There is a problem though - while the IV bags must be prepared immediately before use, they can not avoid making a precipitate that can not get through a filter. Tera then asks my students for help - can they make sure that 85% of the precipitate gets captured by the filter paper? And that they can confirm 90% of the nutrient is actually produced? Immediately after the short video, students read a more formal letter from Tera. Then, in a class shared google doc, they ask questions about the task (What is our reaction? What is our nutrient? How do I know if I got 85% yield? How do I figure out how to make 2.00 g of a nutrient? ). In the words of a friend, I’ve “lovingly manipulated” my students into wanting and needing to learn what I already planned for them to do anyways. 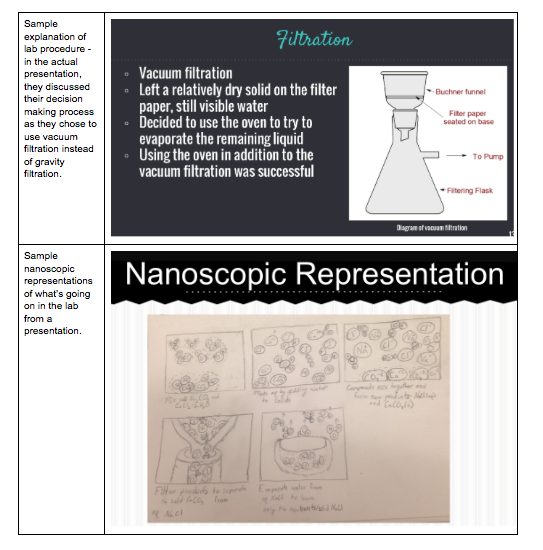 The rest of the three week unit of study, we weave back and forth between the overarching task at hand and lessons on stoichiometry, limiting reactant, and percent yield (they had learned to predict products in a previous unit). This overarching task is a powerful motivator, and throughout this back and forth between learning new content and applying it to the project, students make connections to real world applicability. While this sounds really fancy, I want to impress upon you that I have normal students. I’m not teaching at a magnet school or private school. I have students with IEPs and others that are academically gifted in the same classroom. Facilitating students through these tasks have been the most rewarding and challenging parts of my career. Teenagers (well, most people actually) get nervous when they care and the stakes are higher than normal. Community panelists will do that. There have been tears (and not just from students). I’ve had to go and take a step back to fix things in the thick of a project. I’ve also seen the most unexpected things out of my students. That student who’s been content with a C - who could have known how he’d show leadership within his group and ask for extra help on the content? Or - that other student who’s never really been challenged by the content (try as I might to push) - who would have expected him to think critically about multiple variables that might influence whether or not a reaction should be used for IV nutrition? It’s so cool. And I wouldn’t have seen those highlights without providing these opportunities for students. The best part is that my students get to share their findings with panelists from the community. Over the last few years, the community panelists have never left disappointed. On presentation day, while I grade content, they grade presentation skills and overall message. They are so impressed with the students! It is more than just their presentations. Just like in real life, students are expected to answer a question “on the fly” as part of their grade. After a few class periods, I’ve had panelists engage in asking these “on the fly” questions. There have been some powerful moments, because many of them are about mistakes that aren’t caught in the peer review process (“Why do you think that didn’t work in the lab? Why might that item labeled “dependent variable” actually be an “independent variable”? How might you edit your nanoscopic representation to show how water would interact with that cation?). Students have to face failure and move on with life. That’s what adults do every day, right? (Check out biology teachers and their thoughts on student struggle here in the Washington Post). 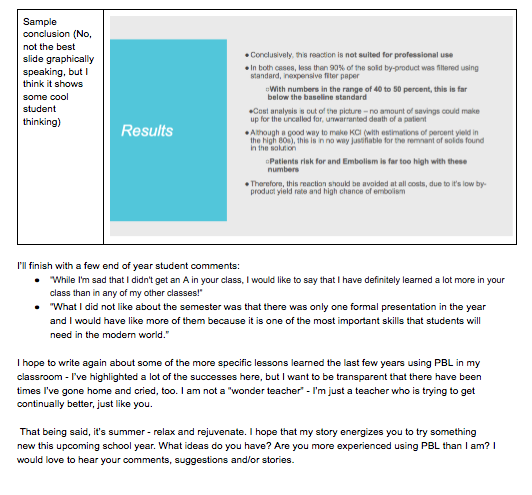 I hope to write again about some of the more specific lessons learned the last few years using PBL in my classroom - I’ve highlighted a lot of the successes here, but I want to be transparent that there have been times I’ve gone home and cried, too. I am not a “wonder teacher” - I’m just a teacher who is trying to get continually better, just like you. That being said, it’s summer - relax and rejuvenate. I hope that my story energizes you to try something new this upcoming school year. What ideas do you have? Are you more experienced using PBL than I am? I would love to hear your comments, suggestions and/or stories. Would you be willing to share these projects in more detail? Tracy has shared several activities. You might want to follow her blog: https://www.chemedx.org/blogs/tracyschloemer to check some of them out. Here are a variety of posts I've written on this project. What ARE my students actually learning during this long term project (PBL)? What it's like to develop a PBL experience from scratch...because I think I forgot. I am finishing up plans for my first PBL to start next week, it is for our chemical bonding unit and involves a crime investigation and identifying substances, I would love to know more about how you tie nomenclature and ionic bonding into your first semester project. That is my goal and I am struggling to make it happen. It was great to touch base with you over the phone! Hey Readers- Here's a bit what we talked about - the goals of the project were to ID two mystery substances as having ionic or covalent bonding, and to name the ionic compound. "Planting" vocabulary that forces students to ask questions in their knows, need to knows, next step document. Using specific terminology in their tasks, like "you must identify the cation and anion, and name the ionic compound" forces students to ask "What is a cation", etc. Then these topics are not a sidebar - in fact,they are a vital part of the larger task at hand. We also talked about precipitation tests for determination of the anion in the ionic compound. Once students have determined the ionic compound via conductivity testing, and then the cation via flame tests, they can use solubility data and reactions you have written for them. They select what they should react their mystery substance with, and the formation (or non-formation) of a precipitate would signify the precense of one anion. Good luck to you, Amber, and to all other brave teachers who are embarking on project design and implementation!